This collection of new poems by one of the most respected poets in the United States uses motifs of advance and recovery, doubt and conviction—in an emotional relation to the known world. Heralded as "one of our most vital, unclassifiable writers" by the Voice Literary Supplement, Fanny Howe has published more than twenty books and is the recipient of the Gold Medal for Poetry from the Commonwealth Club of California. In addition, her Selected Poems received the 2001 Lenore Marshall Poetry Prize for the Most Outstanding Book of Poetry Published in 2000 from the Academy of American Poets. The poems in Gone describe the transit of a psyche, driven by uncertainty and by love, through various stations and experiences. This volume of short poems and one lyrical essay, all written in the last five years, is broken into five parts; and the longest of these, "The Passion," consecrates the contradictions between these two emotions. The New York Times Book Review said, "Howe has made a long-term project of trying to determine how we fit into God's world, and her aim is both true and marvelously free of sentimental piety." With Gone, readers will have the opportunity to experience firsthand Howe’s continuation of that elusive and fascinating endeavor. 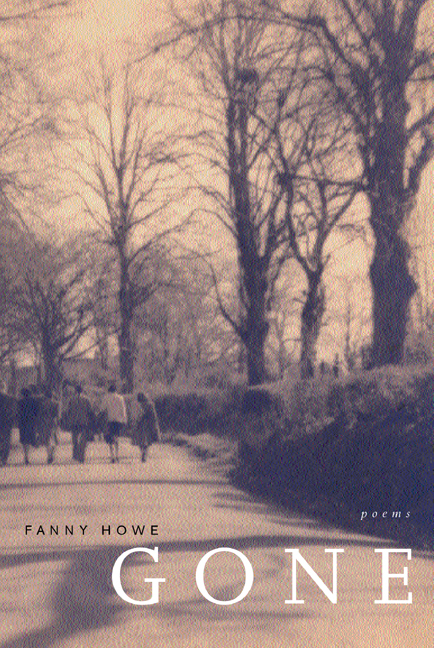 Fanny Howe is Professor Emeritus of Writing and Literature at the University of California, San Diego. She is the author of more than twenty books of fiction and poetry, including Indivisible (2001), Selected Poems (California, 2000), and One Crossed Out (1998).